“Happy New Year!” What, again? Yes, and this time it’s being celebrated in exotic Thailand. Rent a timeshare in Thailand and celebrate that country’s traditional New Year, “Songkran,” April 13 – 15, 2011. Songkran, believed to have been adapted from an Indian festival, has been observed for centuries, and now has also become a party for foreigners and an additional reason for many to visit Thailand to experience this unique immersion in another culture. Traditionally, Songkran was a time to visit and pay respects to elders, including family members, friends and neighbors. Water has always played a big part in the celebration. Originally it was poured over Buddha statues to cleanse them, then captured as “blessed” water and given for good fortune to elders and family members by gently pouring it over their shoulders. 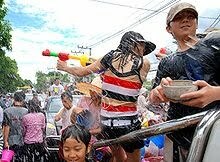 That traditional “blessing” activity has morphed into Songkran being one big water fight party. Nowadays, the emphasis is on fun and water-throwing rather than on the festival’s spiritual and religious aspects. As Wikipedia explains it, “Thais roam the streets with containers of water or water guns (sometimes mixed with mentholated talc), or post themselves at the side of roads with a garden hose and drench each other and passersby.” Of course, it doesn’t hurt that this is a great way to cool off during Thailand’s hottest month. In addition to “throwing water,” Songkran is also celebrated with colorful parades, and ceremonies where birds and fish are set free. In Phuket, the festivities center around releasing baby turtles into the sea. Many beautiful sacred ceremonies are conducted by Buddhists, and sand dome-shaped shrines, called stupas, are built by Buddhists in the courtyards of monasteries. Timeshare rentals are available at the Q Signature Spa & Resort on Cheongmon Beach in Koh Samui, and at Marriott’s Phuket Beach Club. Staying at Marriott’s Phuket Beach Club you can participate directly in the Songkran ceremony releasing baby sea turtles. In 2002, Marriott donated $45,000 to launch the Mai Khao Marine Turtle Foundation. The Foundation’s mission is to raise funds and increase awareness for the plight of the critically endangered giant leatherback turtles that nest in the area. Local villagers patrol the beach at night during the breeding season, protecting the turtles while nesting, and keeping records of the number of eggs laid. When necessary the eggs are taken to a hatchery where the baby turtles are protected from elements of nature and human exploitation, and are then released in the special ceremony celebrating Thailand’s New Year.